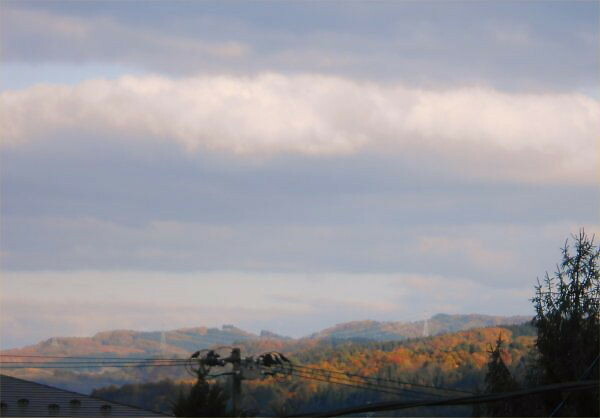 You can see part of “Echigo mountain-range” shot on Saturday, November 23rd from the attic library on the 3rd floor of LL Shihoya Arai School. Being so far from here; that only when it is very fine, it can’t be seen. This direction is to the east; over the range, there is the northern part of Chiba. Hoping two of my friends, Ms. Y who is a poet and Mr. Y, a mathematician are taking a look at this. On Wednesday, November 20th, one of M-PEC members, Ms. Y visited us with her ex-guide dog, Carin. She had *arrived fresh from visiting NSW, Australia. Yoshy and R were presented a pack of dry-roasted macadamia nut covered with chocolate. Whenever she goes on a trip abroad, she recently brings me lots of “*local newspapers”. Thank you very much though they are heavy. 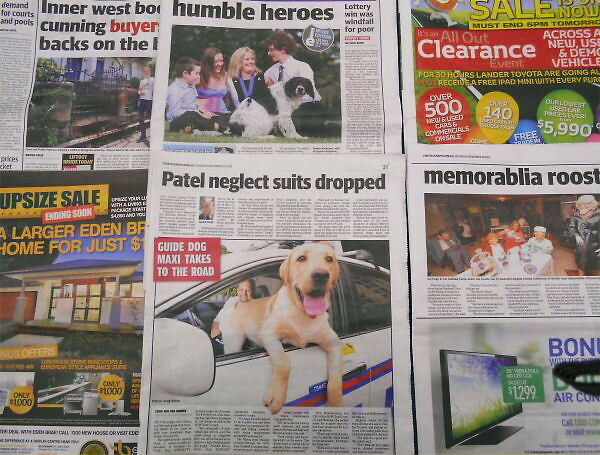 You can see the headline: “GUIDE DOG MAXI” in a newspaper, can’t you? Let me translate this cheerful article into Japanese *part of the way. He’s the puppy who’s being *put through guide dog training thanks to two years of gold coin donations from Sydney taxi drivers. The *appropriately named Maxi, a seven-month-old Labrador, is heading to Guide Dog *NSW/ACT’s training centre in Glossodia. The $30,000 cost of his training has come from donations by cab drivers as well as the NSW Taxi Council. 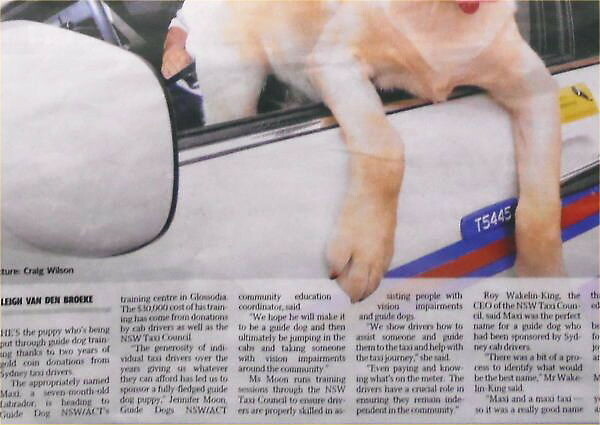 “The *generosity of individual taxi drivers over the years giving us whatever they can afford has let us to sponsor a *fully-fledged guide dog puppy,” Jennifer Moon, Guide Dogs NSW/ACT community education coordinator, said. 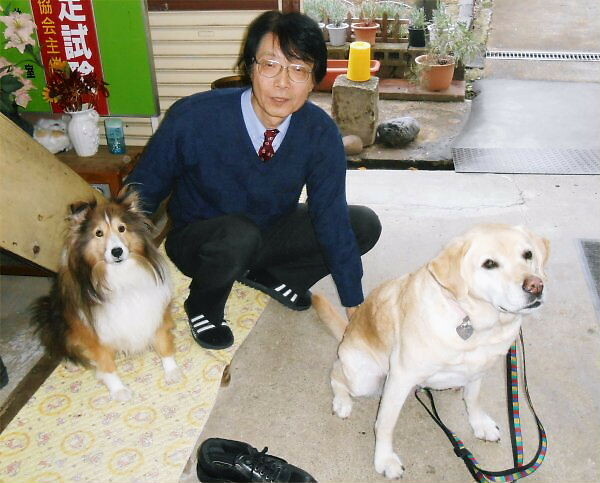 YEA (Yoshy’s English Activity) resumed since November 9th toward the year of 2014; on the 2nd Saturday every month, from 7:00 to 9:00 pm at LL as usual as before. 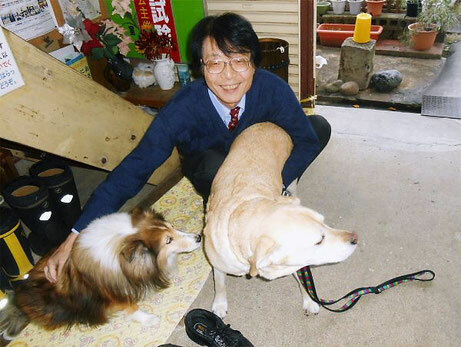 The date of next lesson is December 14th (Sat).